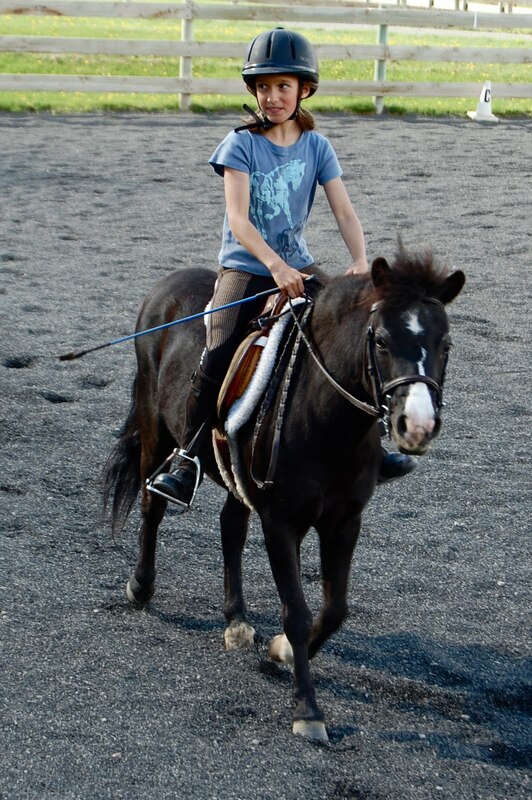 Gretta and pony, Pippin practice trotting in the sunshine, finally starting to feel like summer 'round here! SUMMER SESSION 2011 will run for 6 weeks between June 13th and July 25th. (NO LESSONS on JULY 4th). All weekly classes will take place on Mondays. Tuition : $210. Other opportunities for horsemanship lessons include day camps and private lessons through Moccasin Lake Ranch.The registration deadline for weekly classes is JUNE 6th. This means that registration form & tuition must be received by June 6th! All late registrants will be placed on a waiting list. LITTLE STAR HORSEMANSHIP CAMP I: June 21, 22, 23, 9am to 1pm. This introductory horsemanship camp is being offered as a Little Star summer camp. It is open to children 5-8 years old. Registration and tuition payment must be done through Little Star Montessori School. This camp is expected to fill very quickly so don’t delay! Camp I: July 19, 20, 21, 22, 9am to 1pm. *to secure your spot in this camp for 9~13 year olds send a $200 deposit to: MVRU PO Box 58, Winthrop, WA 98862. Checks made payable to Moccasin Lake Ranch. PRIVATE LESSONS: As always, private lessons and trail rides at Moccasin Lake Ranch are available throughout the summer by appointment. Call 996 9881 or email: annieb@mvriding.org for information, pricing, and scheduling. Keep in mind... enrollment in all programs is limited and we expect classes to fill quickly. So register NOW and be as flexible as possible! Full tuition is due upon enrollment unless other arangements have been made with the Program Director prior to registration. MVRU is committed to providing quality horsemanship programs to individuals, regardless of their financial situation, therefore we have a scholarship program available to those in need, applications available upon request. FOR REGISTRATION, APPLICATIONS, AND GENERAL INFORMATION CONTACT ANNIE AT: annieb@mvriding.org, or call 996 9881. Hope to see ya'll out there!